We had to share our special day with you! Generations United's celebrated our 32nd year on August 5th. Our mission is just as critical today as it was in 1986. Thank you for joining us in building a world that values and engages all generations! Stria posted an article by Trent Stamp,CEO of The Eisner Foundation entitled Time to Turn up the Volume on Intergenerational Programs which features the 2018 Eisner Foundation/ Generations United Report. Learn more. Get Ready for Grandparents Day - Sept. 9! Generations United invites you to Do Something Grand in honor of Grandparents Day. Visit www.grandparentsday.org to get ideas and information on ways to get involved. We are thrilled to introduce Diane Roznowski, our new Policy and Program Coordinator! Diane received her BA from American University in Communication, Legal Institutions, Economics, and Government. During her time at American, she completed various internships including ones at the Addiction Policy Forum and the office of Senator Bob Casey. Additionally, she took the Fall 2016 semester off to work on Hillary Clinton's presidential campaign in her home state of Pennsylvania. In her free time, Diane likes to cook, read, and remind everyone who will listen that the Philadelphia Eagles are the reigning Super Bowl Champions. Please join us in welcoming Diane to the Generations United family! This summer the intergenerational Treehouse Community in Easthampton, Massachusetts celebrates 12 years of family, love, and belonging for children and youth who have experienced foster care, their foster/adoptive parents, and caring older adults! Learn more. Thank you Neighbors Growing Together at Virginia Tech for renewing their membership! Together, we are building a world that values all generations! Donate to help us unleash the potential of an "age-amped" society . If you're an organization, join us ! 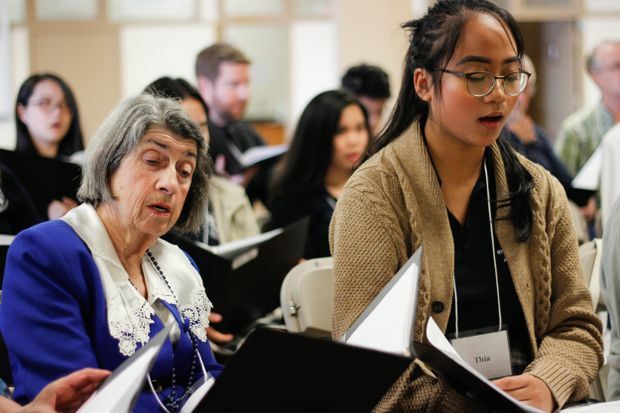 In Victoria, British Columbia adults with dementia, their caregivers and high school students came together for the Voices In Motion Intergenerational choir project led by University of Victoria researchers. 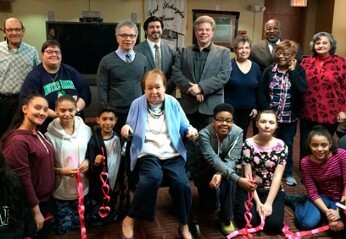 Choir members met every Wednesday for a two-hour rehearsal and agreed to practice their parts at home to prepare for a performance at a neighborhood church.The Voices in Motion choir offered a social outlet combined with an challenging activity for all ages. Learn more. In this book, recommended for children in grades 5-8, Naomi Outlaw lives with her great-grandmother, Gram, and her little brother, Owen, at Avocado Acres Trailer Rancho, where life is happy and peaceful. According to Gram, most problems can be overcome with positive thinking. That is, until someone mysterious reappears after seven years, stirring up all sorts of questions - and a whole lot of trouble. Soon, Naomi finds herself on a whirlwind journey in Gram's last-ditch effort to keep the family together. But will positive thinking be enough to save them? Learn more. Do you have an intergenerational immigration story? Do you have stories of how a grandparent or an elder who was an immigrant influenced your life? Do you work with older or younger immigrants or immigrant families in an intergenerational program or setting? Are you an immigrant grandparent raising your grandchild or older adult who works with young people? Generations United is requesting stories to possibly highlight on our Together blog for Grandparents Day (Sept. 9)! Deadline to submit is Sept. 7. See our submission guidelines, then share your stories with us at gu@gu.org. Last week we congratulated ou r friends in Hawaii on their Gen2Gen Summer Fun(d) m icro grant. Unfortunately we mix ed up some critical information. The grant will fund a collaborative project between between Age-Friendly Honolulu and Blue Zones Project . Age-Friendly Honolulu is the new organization overseeing Honolulu Walks, a Generations United Program of Distinction. Over two hundred people of all ages applied to the Gen2Gen Summer Fun(d) with a wealth of scrappy, creative and fun ideas to bring the generations together. Learn more about all of the 20 winners! Our apologies for the mix up. Does Your Program Have What it Takes to be A Program of Distinction? Does your intergenerational program meet critical needs in your community? Does it provide clear, meaningful roles for participants of all ages and abilities? Do you go above and beyond to train staff and participants? If you answered "yes" to any of these questions, you may have what it takes to be named an intergenerational Program of Distinction! Each year, we recognize outstanding programs across the country that reflect the rich diversity among programs that involve older and younger generations. The deadline to apply is August 31, 2018. Contact Irv Katz with any questions. Learn more . 2018 Diversity Awards. Grantmakers in Aging is now accepting nominations of national, regional, and local individuals, programs, and organizations that embrace diversity as a fundamental element in all levels of their work in aging. Deadline: Sept. 6, 2018. Learn more. The Andy Warhol Foundation for the Visual Arts. The purpose of the Andy Warhol Foundation for the Visual Arts is to foster innovative artistic expression and the creative process by supporting cultural organizations that, in turn, support artists and their work. Grants are provided to curatorial programs at museums, artists' organizations, and other cultural institutions to originate innovative and scholarly presentations of contemporary visual arts. Deadline: Sept. 1, 2018. Learn more. Explore New Territory. ZERO TO THREE. Denver, CO. Oct. 3-5, 2018. Learn more. National Caregivers Conference. The Family Resource Network. Iselin, NJ. Oct. 11, 2018. Learn more. Aging in America Conference. American Society on Aging. New Orleans, LA. April 15-18, 2019. Learn more. "Generations United is a celebration. The creation of Generations United marks the recognition that America's generations, its old and young, its children, students, its workers and retired have never been closer, and at the same time, have never needed one another as much as they do today." - Jack Ossofsky from the National Council on Aging and one of the founders of Generations United during the press conference on August 5, 1986.